Her latest book Three Daughters of Eve is set in Oxford and Istanbul and focusses on three Muslim women, several men, and one big question. Two university cities, both equally celebrated. But one of them far outpaces the other as a setting for literature (most recently in the latest novel by Elif Şafak) and a base for writers. Why has Cambridge has so few books written about it, or set in it? 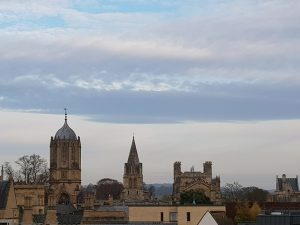 Or is it that Oxford is so far ahead of any other UK city, apart from London, I don’t think there is a place in the UK with more literary, film and broadcast media connections than Oxford. “Oxford exerts a strong influence on those it touches,” says author Val McDermid, writing in The Guardian on the rich catalogue of fiction set in and around the university and other parts of the city. McDermid read English at St Hilda’s College. She followed so many notable writers, such as Charles Dodgson (Lewis Carroll), Graham Greene, who was an undergraduate there, and J. R. R. Tolkien. The Lord of the Rings author didn’t write about Oxford, but he lived there and taught at the University. He is believed to have written the first line of The Hobbit on an exam candidate’s paper: “In a hole in the ground, there lived a hobbit”. And now there is the novel Three Daughters of Eve, written by Elif Şafak, the most widely read female novelist in Turkey. Published early in 2017, this is the latest of many books set in Oxford, where the university and historic centre are an important additional character. So many books and TV series have been set in Oxford, making it one of the most familiar provincial cities in Britain, even for people who have never visited. Its fine wide streets and noble buildings – even its pubs – have been the backdrop for countless TV programmes and films, from Morse and Lewis, through the Golden Compass and Brideshead Revisited to Harry Potter. Even Mama Mia 2 opened in Oxford. ITV recently returned to the city with Endeavour, a series of 90 minute dramas telling the early story of Inspector Morse, embarking on his career in the city. In Three Daughters of Eve, the plot switches between Istanbul and Oxford, an appropriate place to bring certain key characters together in a confined, academic environment to debate the big philosophical question the book poses. The central character Peri, a young Turkish student at the university, is full of spiritual and emotional conflict. She may, incidentally, be the first character in a novel set in Oxford to run, rather than cycle, around the city’s ancient streets. Real places are included – Jericho, the Bodleian Library, various pubs, Broad Street. In the Istanbul sequences, which are equally important in the plot, there is much less sense of place, and the terrible traffic is the dominant background feature. In Oxford Şafak even manages to give the river Thames a role of restful background presence. She clearly knows the city. Yet, interestingly, the writer’s own website, while noting her PhD and her other academic qualifications, doesn’t say whether she studied at Oxford. She uses Oxford, and Istanbul, to explore wider themes, and you don’t need to visit to heighten your reading satisfaction. But I find that visiting a book’s location adds an indefinable something to the reading experience. And how better to visit this very bookish town than with a book in your hand? Her other Oxford choices are The Moving Toyshop by Edmund Crispin, An Instance of the Fingerpost by Ian Pears, Zuleika Dobson by Max Beerbohm, To Say Nothing of the Dog by Connie Willis, Lyra’s Oxford by Philip Pullman, Dirty Tricks by Michael Dibdin, The Lessons by Naomi Alderman and Gaudy Night by Dorothy L Sayers. As for Cambridge, there are a number of good books. Decide for yourself how they compare with Oxford. Culture Trip website suggests The Versions of Us by Laura Barnett; Cloud Atlas by David Mitchell – with elements of the story set in Cambridge; Ariel, by Sylvia Plath – many of poems in this collection would have been written during her time studying at Cambridge University; Case Histories by Kate Atkinson; and A Brief History of Time by Stephen Hawking. This was not about Cambridge, but was written there by this man with a colossal mind. And there is Tom Sharpe’s Porterhouse Blue, is a novel written by Tom Sharpe, first published in 1974, a satirical look at Cambridge life. Three Daughters of Eve is published by Viking (£14.99). Add on Tom Sharpe’s Porterhouse Blue, a novel written by Tom Sharpe, a satirical look at Cambridge life.